At Eurosender, we know that shipping a piano, be it internationally or to another part of town, is a task that many people fear. This delicate and finely-tuned musical instrument can have more than 10.000 separate moving parts, which is why transporting it is certainly not without its risks. However, when shipping is the only option, Eurosender is a logistics partner you can trust. By joining forces with the most reliable courier services on the market, we offer safe as well as affordable piano shipping services for musicians all around Europe. Fill in the individual offer form on our website with all the necessary details. Get informed on how to pack a piano for shipping. Ordering piano removal through Eurosender is easy, quick and affordable. Apart from requesting an offer or booking the service, your only task is to prepare the piano for shipping. Our experts will take over all the necessary arrangements as well as the communication with the couriers. We can even organize the shipping of the piano in a van, thus minimizing the risk of damage. The basic shipping insurance (200€) is always included in the price of the service. However, since pianos are usually more expensive, we strongly recommend opting for one of our additional insurance packages (1000€, 2000€, 5000€). Extra insurance adds very little to the final shipping cost, especially when you consider the peace of mind it brings you. If you need to know even more about ensuring a safe piano transport or if there is anything else we can help you with, let us know. Our experienced logistics specialists and friendly customer service agents will be happy to assist you. Whether you ship a piano abroad or domestically, good preparation and choosing the most suitable logistics option are crucial in ensuring a smooth delivery process. To make your booking procedure easier, go through the below checklist first. Most piano types, including all grand and upright pianos, need to be shipped as freight, which requires careful planning. For this reason, we strongly recommend that you always start the process by requesting an individual offer. In this case, a dedicated logistics specialist will take into account all your specific needs and the nature of your instrument to find the most suitable shipping option for you. Some smaller electric pianos can even be sent using standard package service. If you need to ship one of these, measure the dimensions of its box and use our Shipment Size Checker to determine whether it is suitable for standard shipping. If this is the case, you can check the prices and book the service. If you use standard shipping (electric pianos might be suitable for this service) and want your package to be picked up in Sweden, Spain or Poland, you have to print out the shipping label yourself. You do not need to do this when sending freight or book parcel shipping from other countries. If you plan to leave the pick-up address, make sure you place the order early enough, which is at least 2 days ahead of your departure. You can also appoint someone else to wait for the courier driver if you cannot do it yourself. How big is your piano? Insert the dimensions and weight of your instrument in the calculator below and see if you can ship it on your own (i.e. in a package) or with our professional assistance. When shipping pianos or other musical instruments, protection is essential. Use the following list of packaging materials to make sure you have everything you need to start packing. A pallet– you can use any type of pallet you like(new or used) as long as it is large and strong enough for the type of piano you want to ship. Always carefully measure it and thus make sure that you give us the most accurate information regarding your shipment. This way, our experts will be able to arrange the best possible service. You can buy a pallet at your local hardware store. Moving blankets – this is the first layer of protection for your piano. Buy these blankets at hardware stores. Foam wrap – to further protect the piano. Buy it in a hardware store of your choice, just make sure it is thick enough. Styrofoam sheets – you can get these in stationery or hardware stores. They can be used to stabilize the piano and function as the third layer of protection. Pallet strapping kit or strong plastic bands – to strap the piano to the pallet. You can buy these in hardware stores. When choosing the right type of a strapping system, take the weight and the size of the piano into consideration. Adhesive tape and stretch foil – to secure the padding. Several cardboard boxes – to pack individual components or a smaller electric piano that can be shipped through standard services. Bubble wrap and other cushioning materials like polystyrene chips or foam – to provide protection for items in boxes or the smaller piano. The final selection of the materials and their quantity also depends on your specific need and the type of piano you are shipping. Feel free to also use alternatives like corrugated cardboard sheets as long as they can offer good protection. The crucial thing is to combine several different layers of protection while leaving no part of the instrument exposed to the elements. Exactly how you go about packing your piano for transport naturally depends on its type, size, and other characteristics. Follow our piano packaging tips and ship instrument to the UK, Ireland or any other EU country without issues. 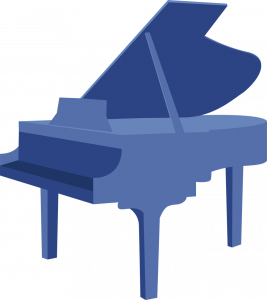 How to move a grand piano or a baby grand piano? Remove any furniture or other objects from the piano’s path. Do this in advance so that the loading can run smoothly and quickly. Remove the legs. They are fragile and can break during the transport. Wrap them in moving blankets or secure them with bubble wrap and pack them in separate cardboard boxes. Lock the lid or remove it. Shocks and jolts of transport can otherwise damage the keyboard. If you want to remove it, make sure it is wrapped in a moving blanket or at least in ample amounts of bubble wrap. Put desiccants in the instrument before packing. This is especially important for those living in more humid regions. Cover the piano with several moving blankets. Make sure it is covered completely and use cords or stretch foil and adhesive tape to keep the blankets in place. You can also add foam padding. How to move an upright piano? Upright pianos are smaller can easily be transported on a pallet. Follow our tips to prepare your instrument for shipping like a true piano mover. Secure or remove the lid. Make sure it will not move during transport or simply remove it and pack it in a cardboard box. To do this, wrap it in bubble wrap and place it in the box filled with cushioning materials. Make sure there are no empty spaces in the box. If you do not have a box that would fit the lid, wrap it in moving blankets and secure well. Place the piano on the pallet. Pad the surface of the pallet with a cardboard sheet and carefully place the piano on it. Cover the piano with a moving blanket. If the piano is bigger, use several blankets and make sure that the whole surface gets covered. Secure the blankets with stretch foil so they can stay firmly in place. Add several layers of foam wrap. Be generous when wrapping the piano. Just like in the previous case, secure the foam wrap with multiple layers of stretch foil. You can also use bubble wrap of cardboard sheets. If needed, secure these with several layers of duct tape to make sure everything stays firmly in place. Strap the piano to the pallet. Use a strapping system and wrap the bands tightly around the piano in every possible direction to prevent any shifting. If you have other boxes with components packed separately, attach these to the pallet as well and make sure they are secured firmly. Build the crate around the piano. If you have already used several layers of protection up to this point, this step is optional. However, we highly recommend going ahead with it. Use several sheets of plywood or any other material you deem suitable. Attach these to the pallet and finish the structure by putting a lid on it. If you have no resources to build a crate, you can always use cardboard or Styrofoam sheets as the last layer of protection. How to move an electric piano? Remove the piano from the stand. Disassemble the stand so that you can pack it together with the instrument. Wrap the piano in bubble wrap. Use several layers and make sure it is completely covered. Prepare the box. It is best if you take the original box that your piano was delivered in. Thus, you will get a perfect fit and make packing much easier. You can also save original Styrofoam or cardboard padding. If you do not have these materials anymore, simply cover the bottom of the box with your padding of choice (Styrofoam sheets, foam, packing peanuts). Put the piano inside. Pack additional components separately. Wrap cables, pedals and the stand in bubble wrap and add them in the box. Fill the remaining space with extra packing materials so nothing can move. Check and seal. Gently shake the box to make sure everything stays firmly in place. If this is the case, seal the box with adhesive tape and you are done. The cheapest way to ship a piano with the couriers you can trust? Moving abroad or to another part of the country. When leaving the trusty old piano behind is not an option, Eurosender is here to organize a safe and quick transport. Stretch your fingers and play wherever you are. Selling a piano. Whether you are a small company or just trying to sell your old piano, arranging a safe and affordable transport is crucial for a successful business. Eurosender offers you the cheapest way to ship a piano without compromising on the delivery quality. Having a piano repaired or restored. If transporting the piano to the workshop is unavoidable, use our removal or freight service to avoid the stress and excessive costs. Buying a piano. Do you plan to buy a used piano and do not yet know how to transport it to your home? Get in touch and we will find the best solution for you. Are there any piano packing tips or bits of info you are missing? Call us or write us an e-mail and we will be happy to include even more info in this guide. Take into consideration these guidelines when shipping a piano. Nevertheless, please consider that following them does not guarantee that the courier company will transport your package without restriction. In case you decide to ship a piano, Eurosender will not be held responsible for any damages caused by the transportation of your shipment.